LED lights have come a very long way. Almost any fixture can accept a led bulb. Now you can even choose between warm white and cool white for your led bulbs, and they now will melt the snow around the fixture so your lights will be seen in the winter. 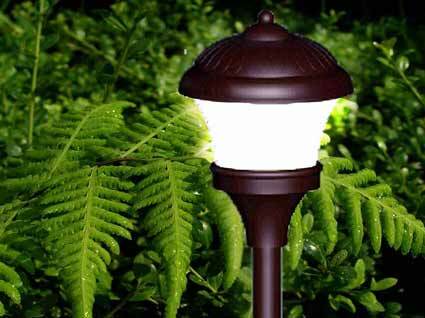 Up lights and down lights are the 2 most popular forms of landscape lighting. Up lighting is used for trees, structures, and architecture. Down lighting is used for lighting statues, tables,pathways, and driveways. Moon lights are used to cast tree branch shadows on the ground to mimic moon light. This has a dramatic effect on any landscape. It is best to pick an area like the patio, deck, water feature or parking area for moon lights. Path lights are used to light path ways, bed lines, and water features. Unlike other landscape lights these fixtures are the landscape lighting fixture that you will always be able to see. that is why there are so many different models. Water lights are used to light ponds, waterfalls, pools, and fountains anywhere in the water, or very close to splash range of water, it is necessary to use water lights. Water feature water lights can even be disguised as a rock to fit into your water feature. Deck lightis are used to light decks, pergolas, steps, and address posts. These lights can be recessed into the surface or mounted to down light the structure. there are even clip lights that mount under the cap stone of your patio retention wall. Ground lights recess into driveways, patios, and sidewalks. If you want your driveway lit up and there are no trees to down light it from, then these lights are the best option. They can be recessed into the brick, concrete, or black top. Fiber optic lights are used in water features and especially pools. Fiber optic lights have many colors, and some systems even change colors. These lights are great around water because there is no electricity in the water to run them. Our landscape lighting designs stand out from the rest. We create a truly beautiful landscape lighting installation that comes with a 5 year guarantee on parts and labor. 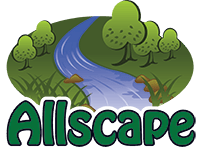 Allscape service techs are able to install new lights, repair old lights, trouble shoot electrical, and change all bulbs. $250 off any landscape lighting installation of 10 lights or more. Copyright 2009-2018 Allscape, Inc. All Rights Reserved.